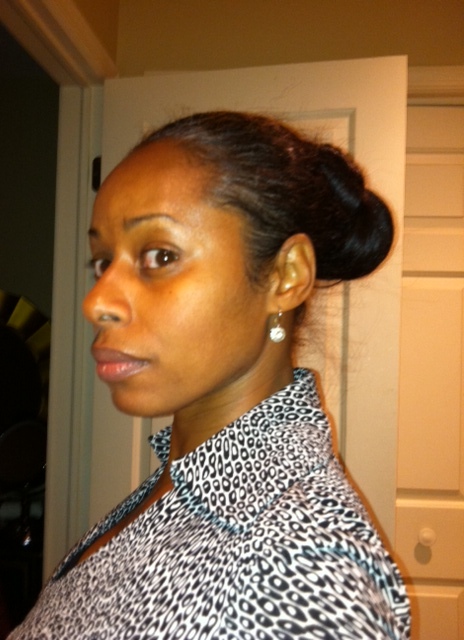 Now, in the past, I would deep condition overnight in a minute … shoot, in a millisecond. 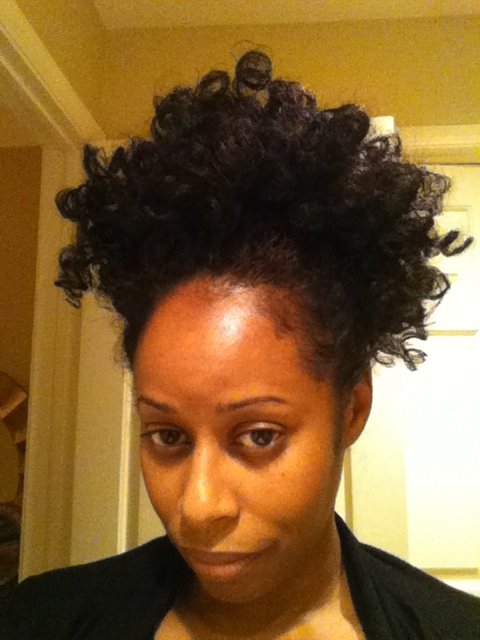 But, over the course of 2011-2012, I learned about the importance of protein, protein/moisture balance and that I could, in fact, over-condition my hair. I realized that the very soft feeling that my hair had for most of 2011 was because my hair was over-conditioned and that the crazy shedding that I was experiencing in fall 2011 was likely my hair breaking, because it didn’t have enough tensile strength. However, though I began to incorporate protein into my regimen and felt a great improvement in the strength of my hair and saw my curl pattern return, I still slept in deep conditioners often. Now, the thing is, I didn’t do this to get any additional benefits, rather, I would sleep in my conditioner out of sheer laziness. Sometimes, I’m tired and I just don’t feel like washing it out. [W]hen conditioner is heated to 35°C, at 10 minutes there is slightly more than 5% on hair and at 30 minutes there is slightly more than 10%. Therefore temperature increases adsorption. The rule however remains the same in terms of no further conditioner sticking to the surface after 30 minutes. *There are two charts in this post that are very helpful in providing visuals for the effects of time and heat on deep conditioning. 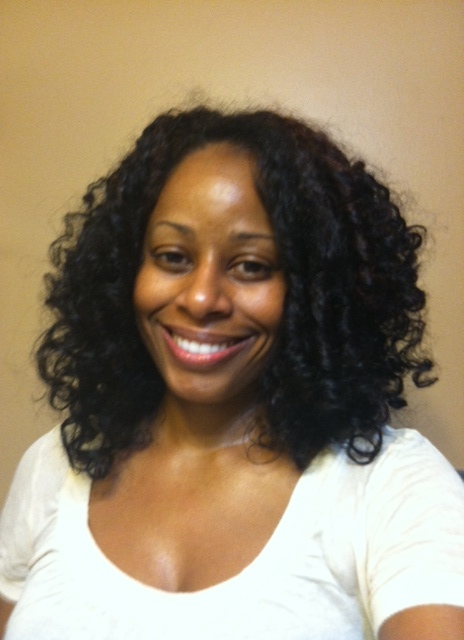 Do You Need to Deep Condition Your Hair? A study done on nails (same keratin protein as hair) was performed to find out why nails get weaker with repeated water exposure. The study found that exposing nails to water for over 15 minutes (remembering that at 15 minutes the protein is saturated) led to the keratin coiling different from normal and this was linked to softening and weakness (BBA,pp 210-216,1999). There are many naturals who will condition their hair for hours at a time because they like the softness that it develops. If you are in this group, you are someone who likes over-conditioned hair. The softness you are feeling is most likely related to the change in the keratin and you should be careful when handling your hair when it is that soft as it will be weaker until it has time to recover its stronger conformation. Well, after reading that 1) Conditioning over 30 minutes does not provide any additional benefits as adsorbtion plateaus and 2) Conditioning for hours at a time causes a a change in the keratin that results in softening and weakening, I started re-thinking my post-wash, deep conditioning habits. Now, though I have pretty much stopped deep conditioning overnight and often only deep condition for 30 minutes to an hour, I still condition for 3-4 hours on occasion. But again, it’s not to get any additional benefits … it’s just because I don’t feel like getting up to rinse my hair and style it!! I KNOW!! LOL!! 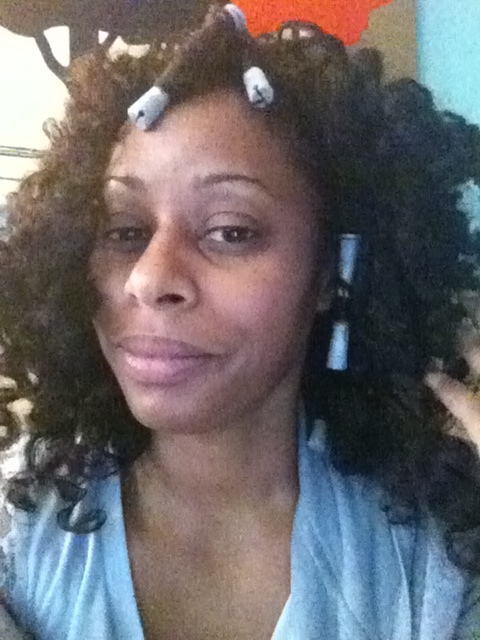 But, I’m really working on keeping deep conditioning down to 30 minutes or a max of an hour!! 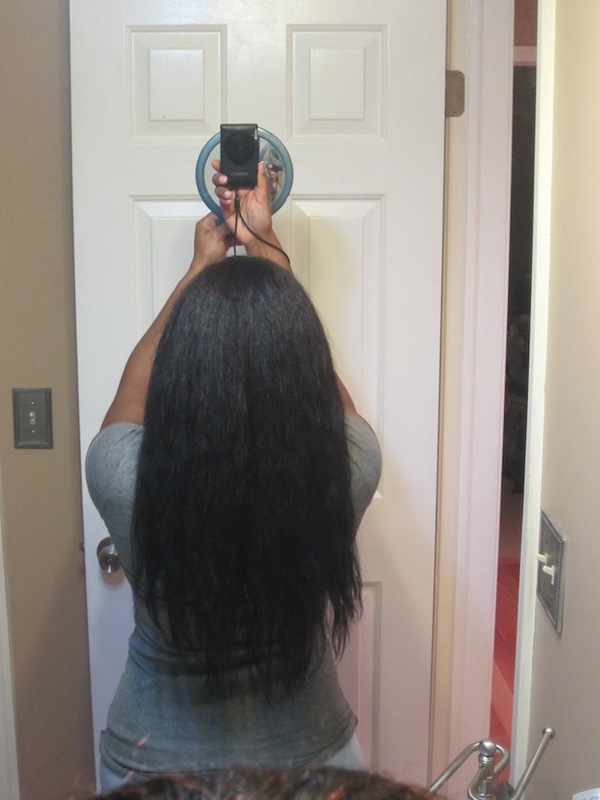 How long do you deep condition? 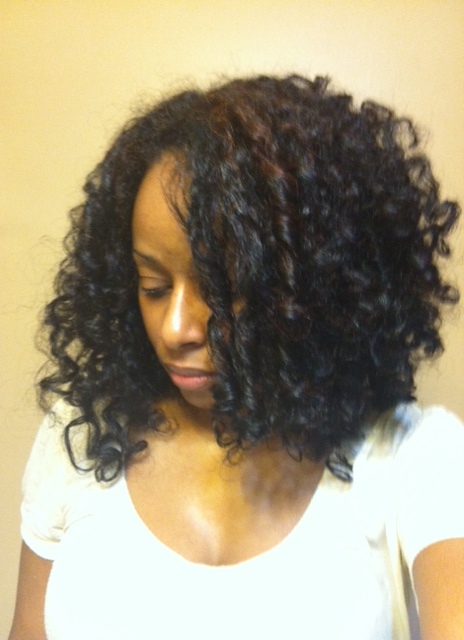 Do you deep condition overnight? Last month, I straightened my hair and, though I was pleased with the length I attained, I was disappointed that my perimeter wasn’t fuller. 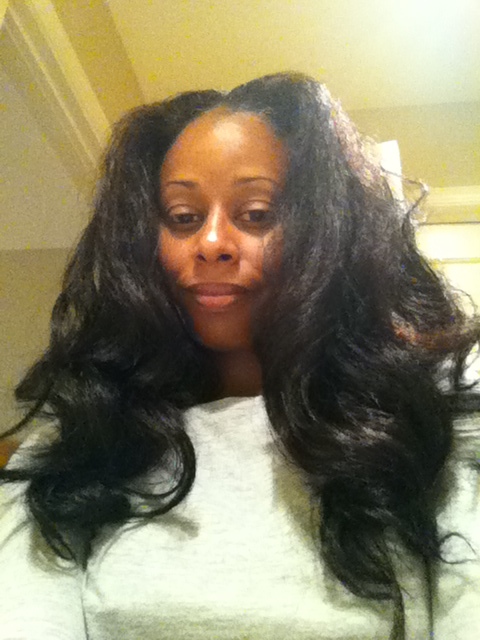 You see, ever since I entered the Curly Nikki presents Kim Coles’ Grow Out Challenge in early 2011, my goal has been to have waist length hair with a full perimeter. 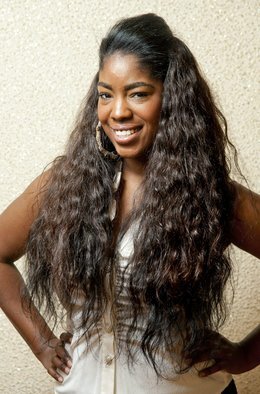 I dreamed of having a “hemline” that looked like that of one of my hair crushes, Courtney Natural Hair. 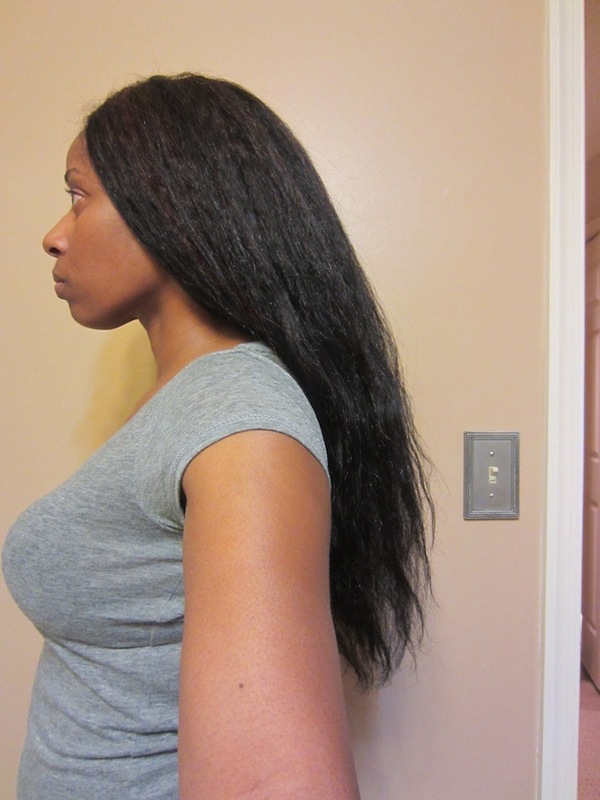 Although I’ve surpassed waist length a couple of times since then (I’ve had one trim and two haircuts since January 2012) … my slower growing and more breakage prone crown, low density nape, propensity for search and destroy (S&D) missions, and a layered cut have prevented me from achieving a full thickness perimeter. 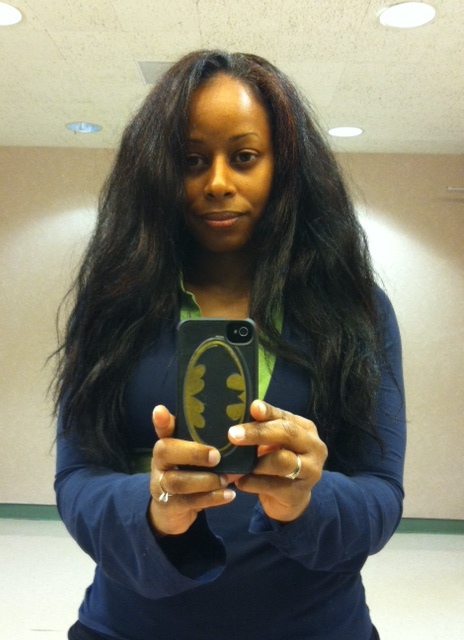 December 2012: Prior to 12/16/12 cut. As I mused over the elusive, full hemline that kept evading my grasp, I happened to end up watching Lord of the Rings: The Two Towers one evening. It was shortly after I had my hair cut and specifically requested that more length be taken off of my longest layer and less off the shorter layers so that I could thicken up my perimeter. 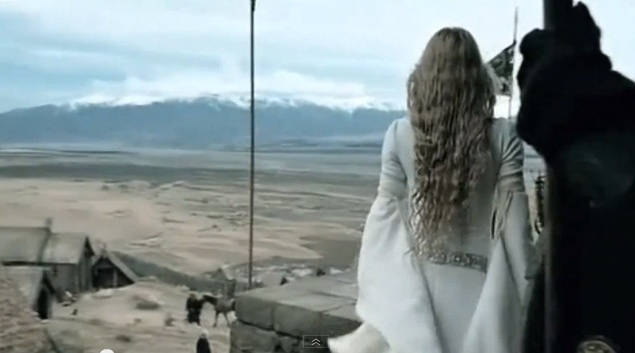 But, as I looked at the women in LOTR and their long, flowing, wavy hair, it struck me that their wavy locks were also not blunt or full at the ends. And, you know what? I kind of liked it!! I then remembered that this type of perimeter is called “fairytale” ends. I think that I came across the term a couple of years ago on The Long Hair Community forum in thread like this one here. As I started perusing the pages of the post, I began to think about how many of us equate a thick, full perimeter with healthy hair and a wispy, thinned one with damaged, unhealthy hair. But, as I looked at the pictures on the thread, many of the women appeared to have very healthy, shiny, long hair despite having wispier ends. As I read the comments, I noted that the fairytale ends were attributed to varying hair growth rates and employing S&D trimming versus overall trims/cuts to make the ends even. 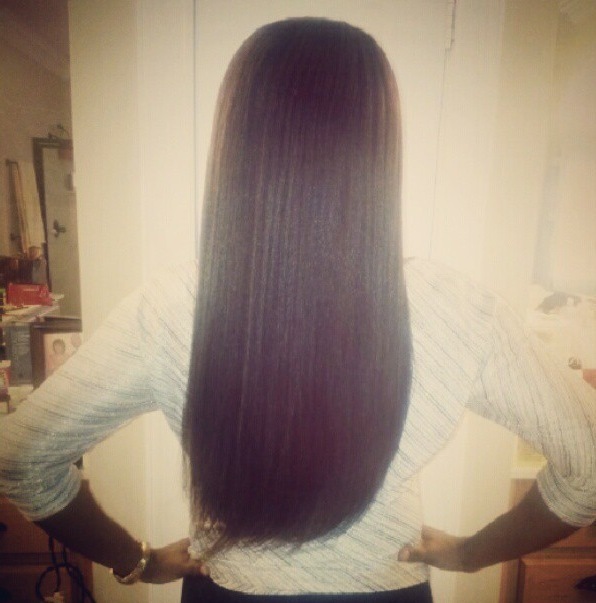 The thinner ends weren’t frowned upon as unhealthy, damaged, broken or “dead” (I love that one — all hair is dead! *lol*). It really was interesting to see how this type of hemline was celebrated, and even coveted, in this forum as it is viewed as more natural looking and enables easier updos due to the tapered ends. Also, similar to Chicoro’s “Lead Hair” Theory, it is espoused as a way to achieve longer lengths as one is not constantly cutting hair that grows unevenly (due to varying growth rates) even, which results in the loss of healthy hair length. 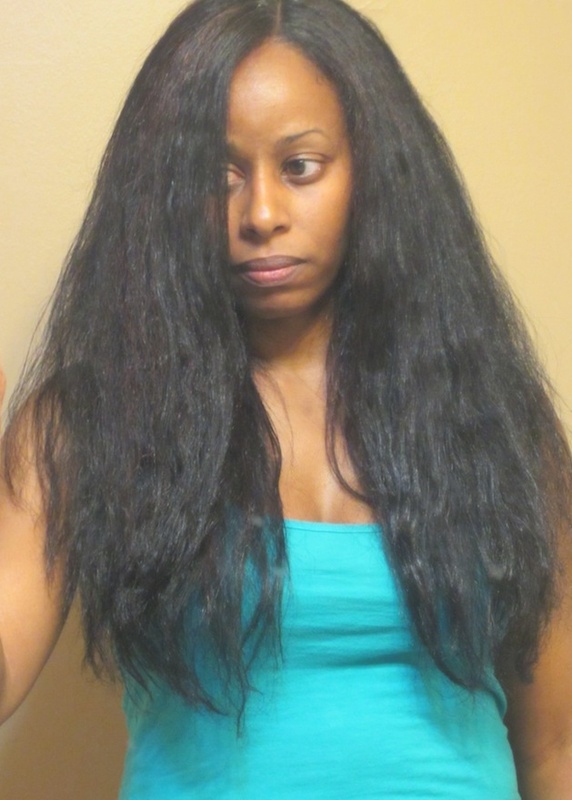 In contrast, when I attempted to find a similar thread in the Long Hair Care Forums (the black counterpart to The Long Hair Community) I didn’t have much luck. The only thing that I found was this thread: Girl, ur ENDS are JACKED UP. LMBO (I’m sorry, that subject is HEE-larious to me!) In this thread, one young lady references fairytale ends and how she thinks they look nice on longer hair. A couple of others essentially said the same. And a few commenters did state that thin ends did not necessarily mean damaged hair. However, the overall consensus was that thinner ends look wrecked, they need an “aggressive” cutting and “hanging onto thin ends” for the sake of length is pathetic. I think in the black hair community in particular (though this does seem to be a universal view), thin ends are typically seen as a sign of broken, damaged, unhealthy hair and we’ve been conditioned to think that there is no way that wispy ends can be healthy. If someone insists that their thinner ends are healthy and their hair isn’t damaged or excessively breaking, we give them the *side eye*. And, don’t get me wrong, in many instances, thin ends are a sign of damaged hair. But, I’m discovering more and more, that may not always be the case. As I continued to think on this, I realized that, generally speaking, I had never been too concerned about even hair. 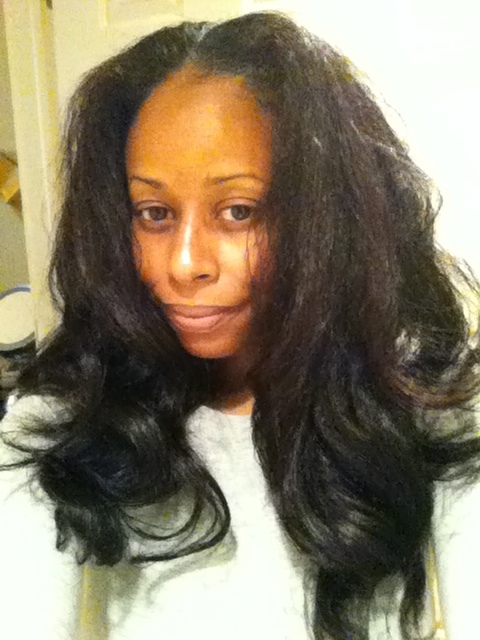 Over my 12 1/2 years of being natural, I generally only wear it straight twice a year. As long as it hangs well when curly (which can be a challenge given my multiple curl patterns) and feels healthy, I’m good. And, when I do wear my hair straight, I have never gone for the pin-straight look. I always curl it in some fashion to give it volume, body and bounce as my hair is so fine and would be very flat if I wore it bone straight. Finally, I thought about how even long, wavy or curly weaves or wigs often don’t have a blunt perimeter and usually have fairytale ends to make them look more natural. So, all this being said, I’ve started re-thinking my two year goal of achieving a full thickness perimeter! I mean, I still love a full hemline and I still want mine to be thicker than it is above (think I’m on the right path with my last cut). And, of course I want my ends to be healthy, which is why I cut off any split ends and SSKs that I feel or see regularly. But, now, I don’t know if I’m worried about my hemline being blunt anymore. I’d like to get to tailbone/hipbone length as my ultimate goal. But now, I think I’ll be happy with, and may even prefer, a healthy fairytale hemline on me versus the elusive blunt one that I’ve been seeking for the last two years. Go figure! Please feel free to expound upon any of your answers and/or add your thoughts on this topic in the comments below! So, this is just a quick update to show you guys how the curly ‘fro fared on days 2 and 3 with pineappling at night. Overall, the pineapple worked well on Monday night. 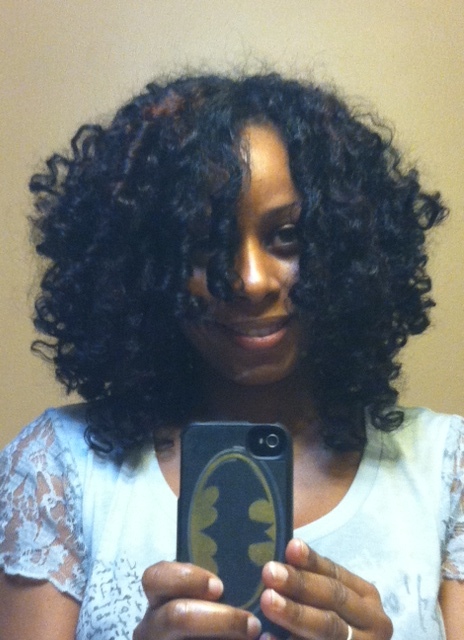 My curls held up except for a few that loosened on one side (the side that I sleep on, of course ;)). 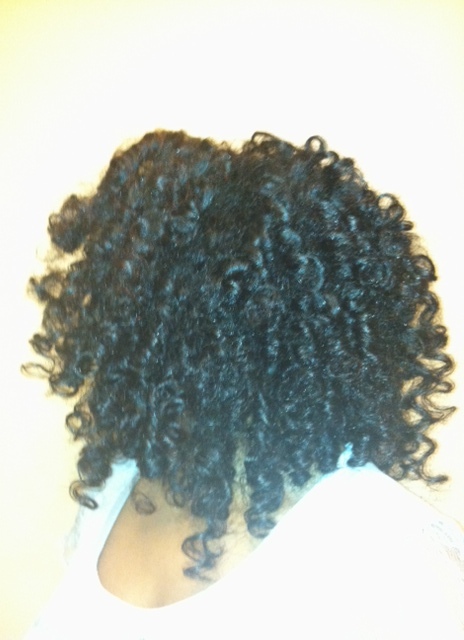 So, I did a little repair work using Deva Care Set It Free and the grey flexi-rods! It actually didn’t look too bad, but it was definitely getting frizzier and some curls were drooping too much. Thank goodness for the Hairscapades Bunning Challenge. As I’d worn my hair down two days, it was time to put that bad boy up! So, quick, easy, high bun it was! I did another simple and quick bun on Thursday (low this time), but didn’t get a pic … I mean, it’s all pretty much the same now. 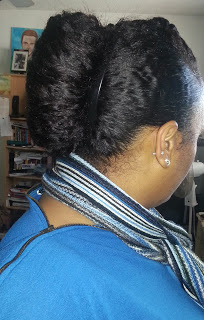 I did manage to take a pic of the quick bun I did with ONE Goody Ouchless elastic on Friday. This was after a loooooooong day at work. Do you see the red eyes? I was DONE! So yeah, that’s how the Curly ‘Fro turned into a bun over the course of a week. And, I know what you’re thinking, “How hard was it to detangle that on wash day?! ?” Well, we’ll talk about that later. 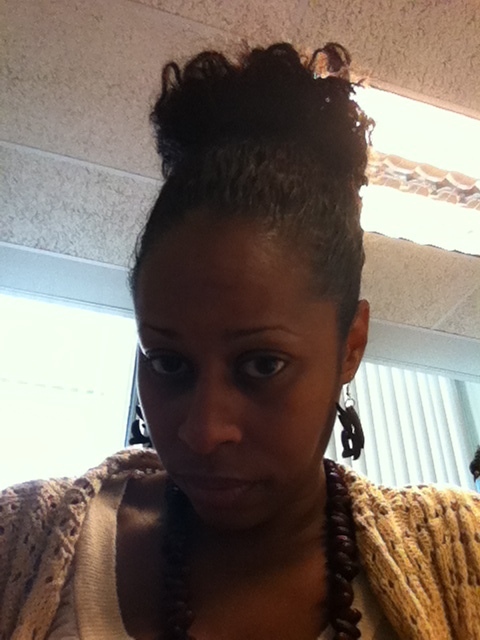 So ladies, the Hairscapades Bunning Challenge was supposed to end this Saturday, 1/12/13. However, I’m planning on extending it another 2 months because I didn’t achieve my goal to gain another inch all around … because I got my hair cut in December!! LOL!!! 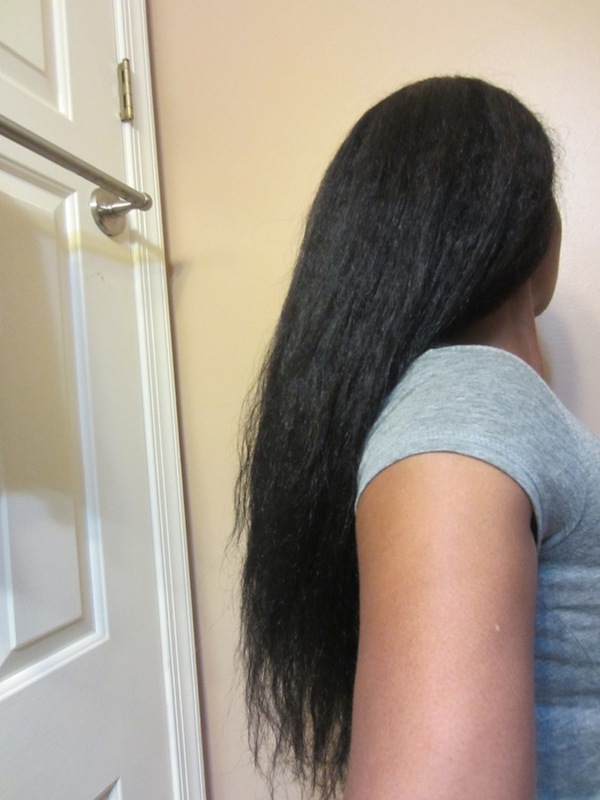 But, it’s in better condition now and I’m seeing a lot less shedding and breakage, so it’s all good!! That being said, who’s with me?!?! Want to take this bunning thing to March 9th?!?! Okay, super quick update. 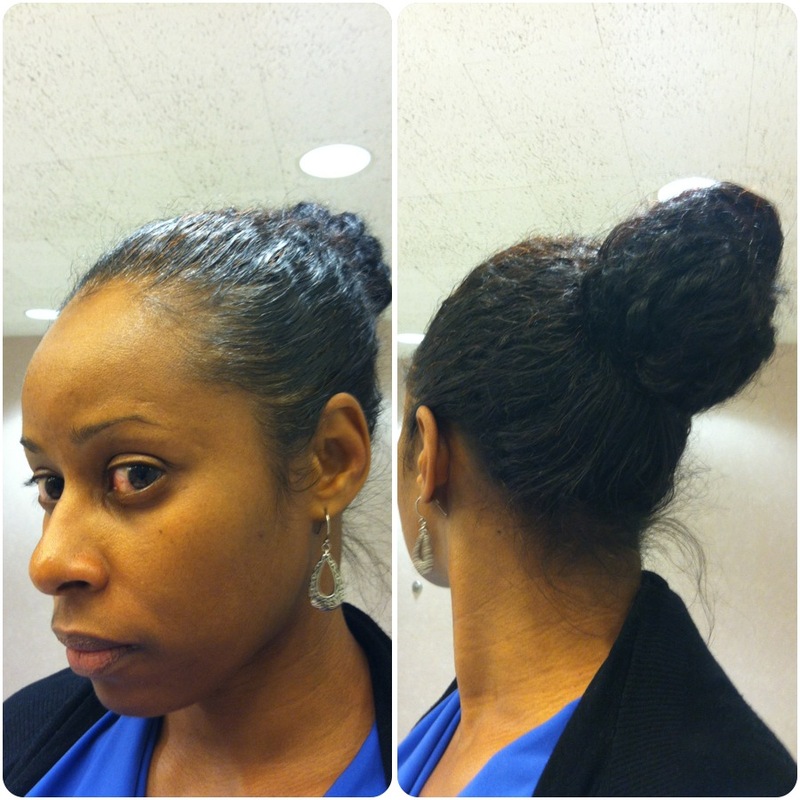 I wore a pretty standard boring bun all last week. But, around Thursday last week, I knew that there was no putting off a henna/indigo treatment anymore. The roots were GLARING!! So, with a four day weekend ahead of me, I knew that I could get ‘er done! I’d already mixed and frozen a couple of boxes of henna a week ago. So, I just needed to decide which kind I wanted to use, thaw it and get to work. I had mixed and frozen a box of Dulhan and Godrej Nupur and decided on the Nupur. I’d picked it up several months ago from my local Indian grocer, Patel Brothers, for about $4 based on the review of Marsha of Hairology. It is a BAQ henna, but has 9 other ayurvedic “herbs” added into the mix. Godrej Nupur brings to you the best quality Rajasthani Mehendi with 9 carefully chosen natural herbs. The ingredients are added in perfect proportions to give your hair the fabulous shiny & silky feel that you desire every single day. Following are herbs used in Godrej Nupur Mehendi with their benefits. Brahmi – Promotes hair growth. Shikakai – Leaves hair clean & shining. Aloe Vera – Maoisturises hair & makes it silky. Methi – Conditions, nourishes & revitalises hair. Bhringraj – Makes hair luxuriant. Amla – Darkens hair colours, adds shine & luster. Neem – Fights scalp infection & prevents dandruff. Hibiscus – Rejuvenates hair making it shiny & silky. Jatamansi – Prevents graying of hair. … All went well!!! No itching to speak of and, post 4 hours of henna/heat … great grey coverage!! Of course, after this, I had to apply indigo to the crown of my hair and then deep condition. 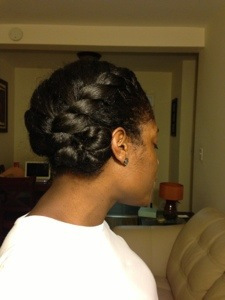 Now, after dealing with my hair all day (started at 11 am, finished around 7 pm), the styling session was SUPER quick. I applied a little Aubrey Honeysuckle Rose conditioner as my leave-in, placed my hair into 6 braids and sealed with my coconut oil body whip *lol*. It was dry the next morning by the time we were getting ready for my family Christmas Eve dinner (actually, the above pic is of dry hair), so I was psyched. 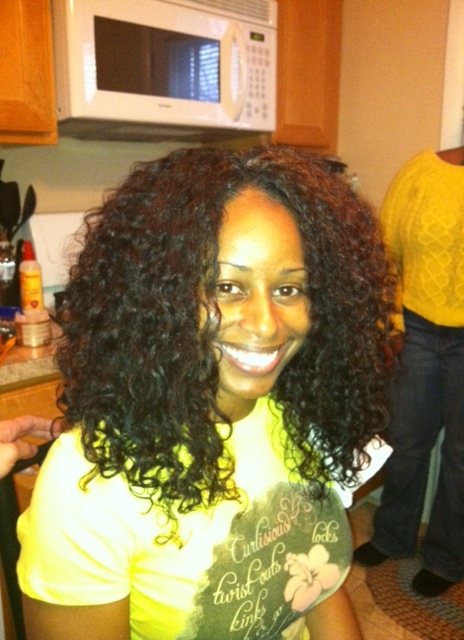 And, I released the braids to reveal a pretty nice braid-out! But, it was up in a bun before we went out the door. I know, I know! 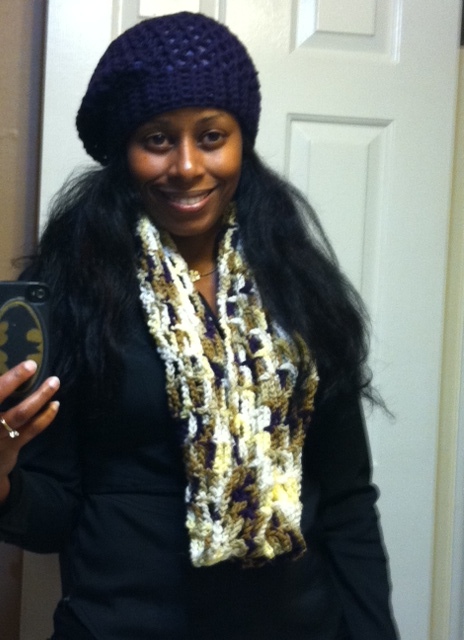 But, I had on a corduroy blazer, a wool coat and a scarf!! That’s a lot of friction and it’s exactly why I’m in the midst of this bun challenge! And no, it wasn’t even a fancy bun. It was a plain ol’, regular boring bun that wasn’t even that smooth around the edges. No pics. Alright that’s it! Gotta go!! 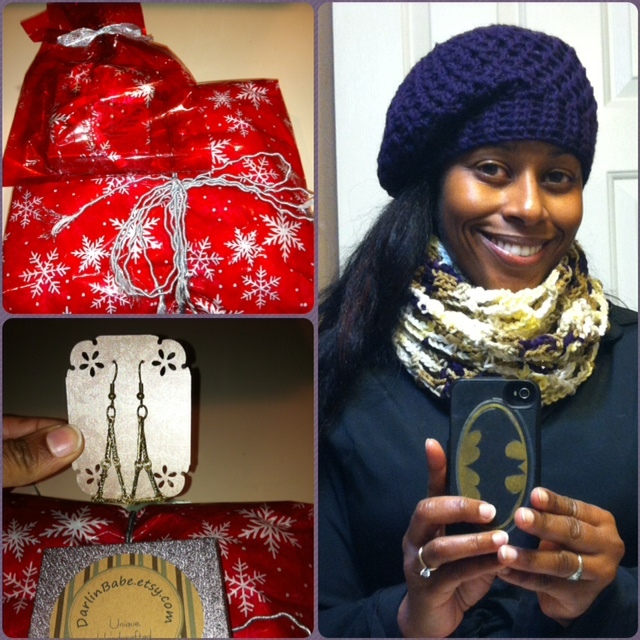 Hope that you all had wonderful Christmases!! 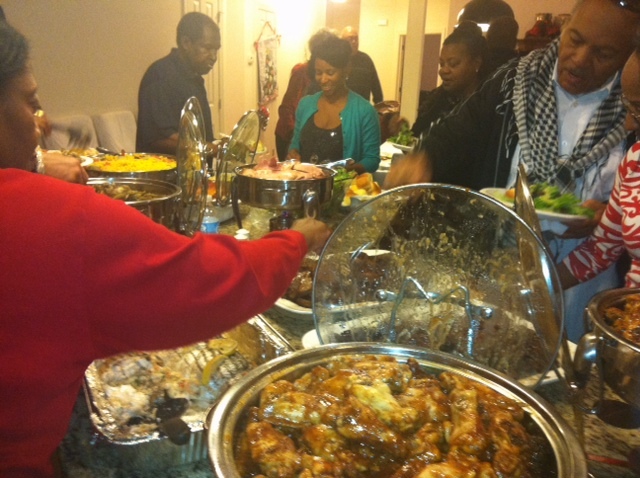 Mine was nice, spent with my family on both sides, but pretty uneventful! 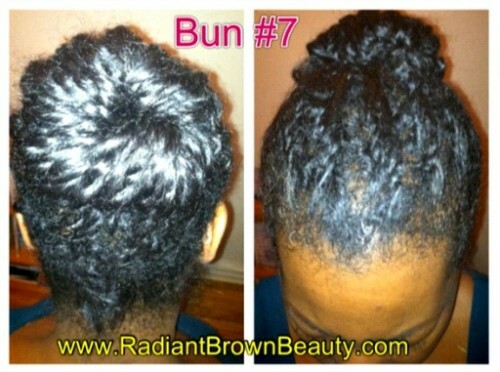 Okay Bunning Challenge ladies! Who is still doing this?!?! C’mon, give a quick shout and let us know if you are still hanging in there! Okay … so, let me put this out there right out front. I cheated. I did NOT wear a bun 5-6 days last week. Yes, I know. Shame on me *sheepish grin*. But, in my defense, because my hair was straight, it didn’t get all matted at the neck and tangled like it does when it’s curly! 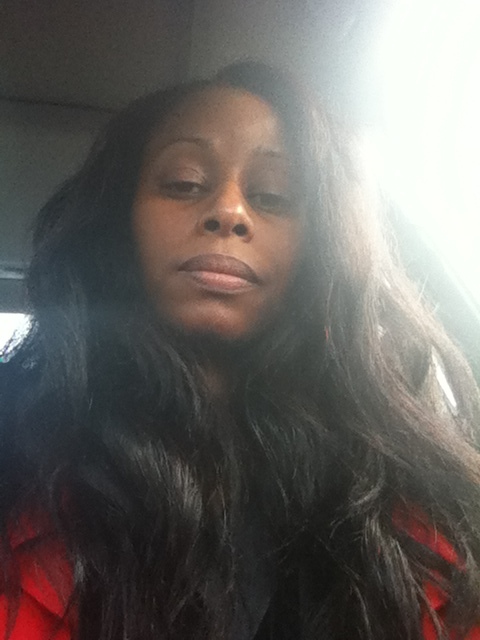 And, despite the fact that it RAINED off and on ALL week, my straight hair held up amazingly well!! I also didn’t completely abandon the challenge ;). So, let me figure this out. 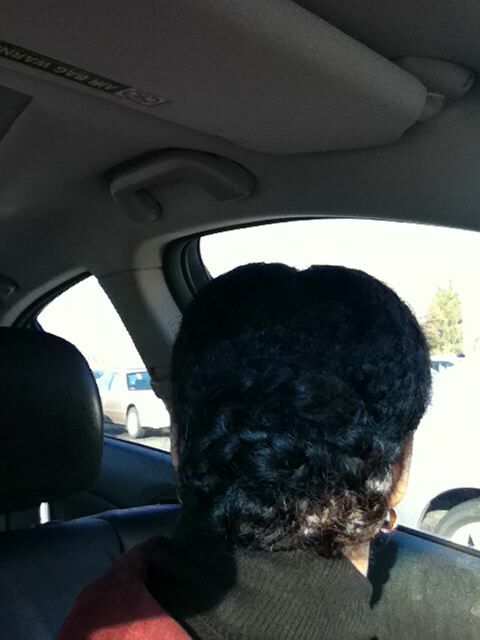 I pre-pooed and washed my hair on Sunday to set it into two braids. I wore a braided bun on Monday for work. 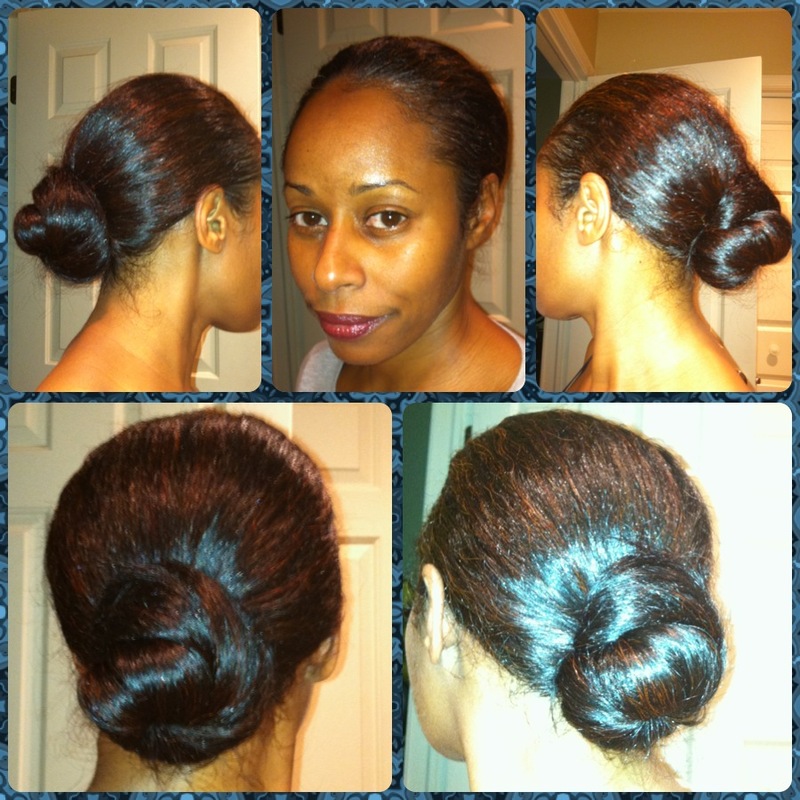 On Monday night, I flat-ironed and placed my hair in a single mid-height bun for bedtime. 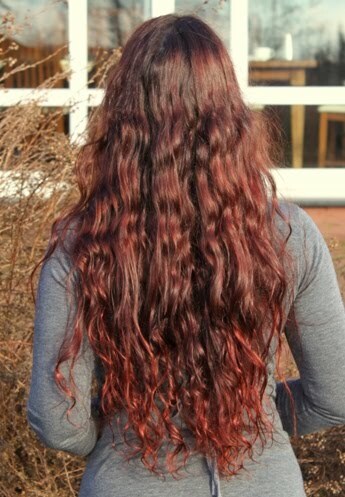 This resulted in a “beach waves” look that I wore to work the next day. 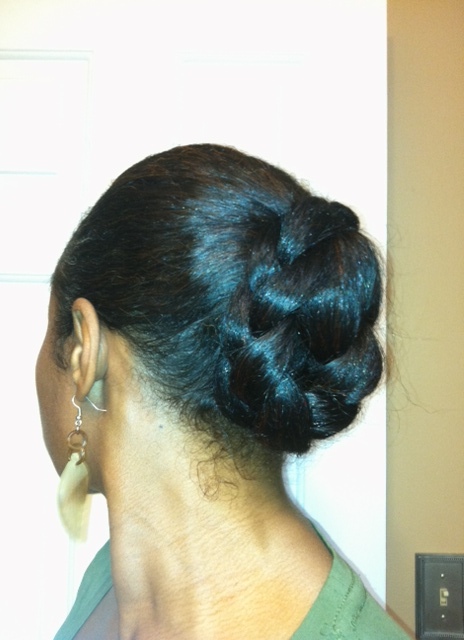 On Tuesday night, I set my hair in two buns when I got home, a high one and a low one, to provide more waves. So, I wore my hair out again the next day. 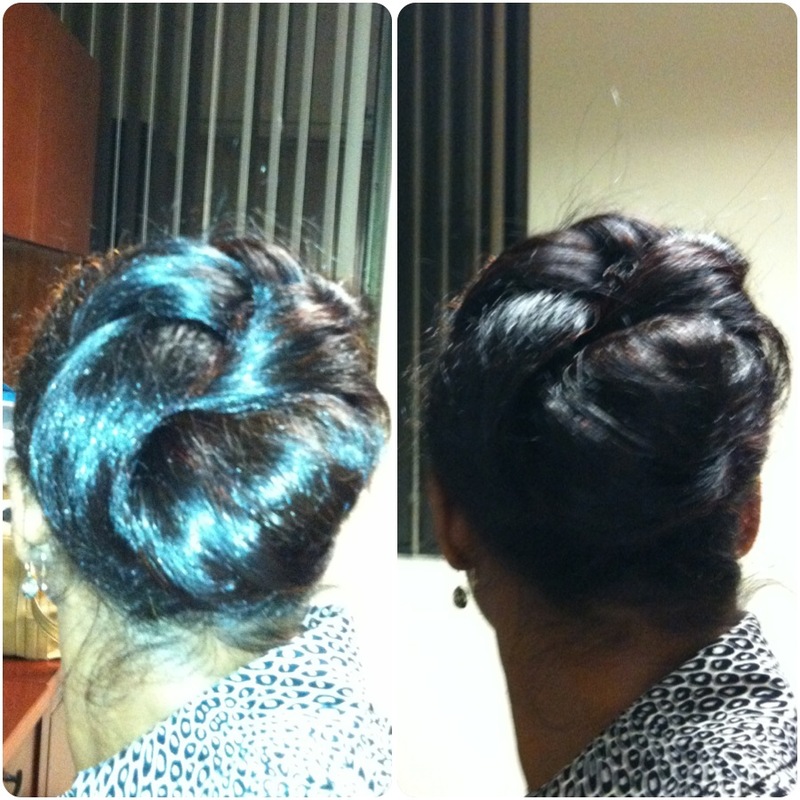 On Wednesday and Thursday night, went back to the single bun after work. I didn’t take a decent pic of my hair Thursday. 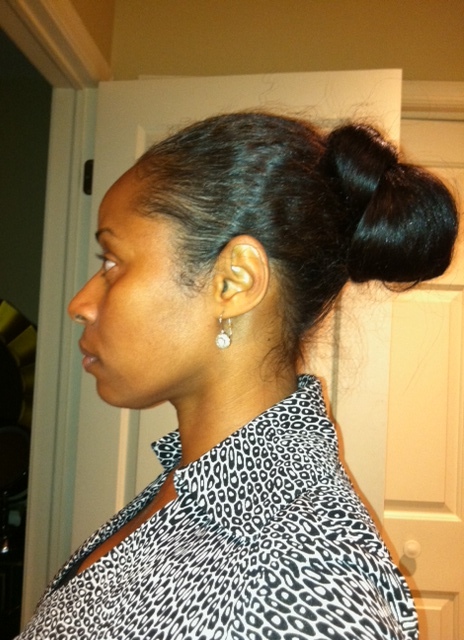 But Friday morning began with loose beach waves that I promptly placed into a twisted ponytail for the work day. 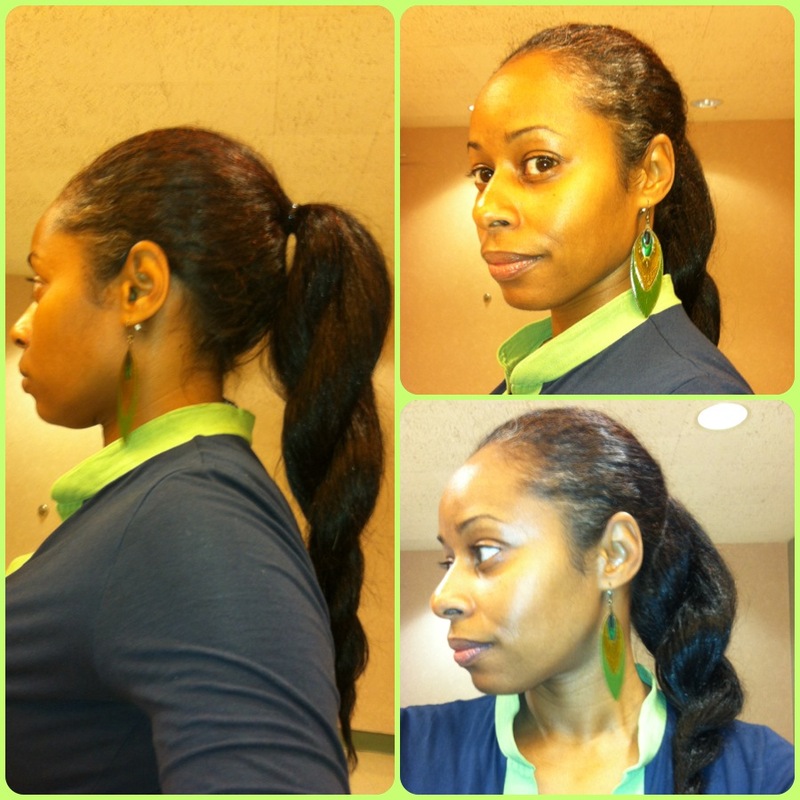 I wore the same twisted ponytail to run errands on Saturday as it was still nasty and wet out. When we got home, I placed the pony into braid that I bunned and wore to bed. 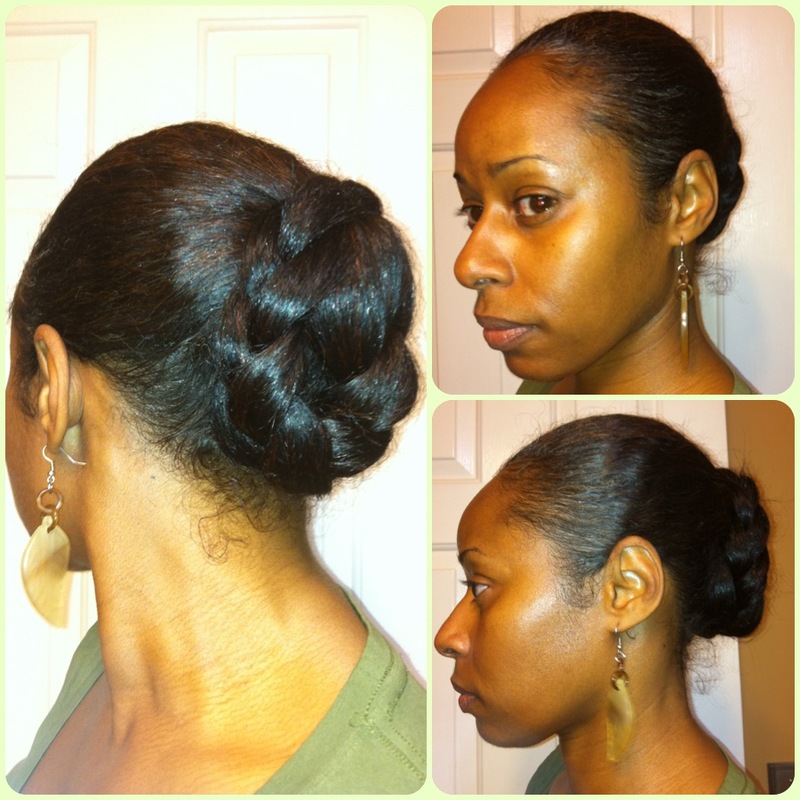 On Sunday, needed to head back out to for more errands and decided to re-set the braided ponytail and loop it into a bun. Good thing, because it was REALLY raining Sunday!! Ughhhh!! I really liked the braided looped pony, so very well may be wearing that today as I’m not washing my hair again until this weekend. Gotta get two weeks out of the straight hair at least ;). 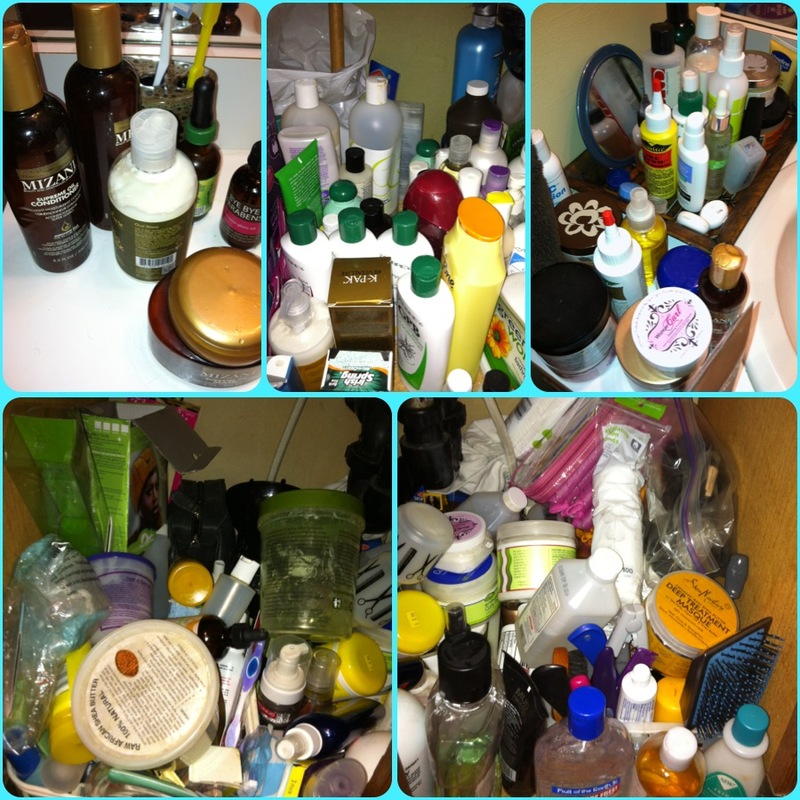 So … you’re probably wondering what products I used on my hair while it was straight, right? Well, y’all know I have a ton of stuff sitting around. No? You didn’t know that? Well, let me show you. OMGosh!!! This Shea Moisture Raw Shea Butter Reconstructive Elixir is like liquid gold for my curly or straight hair!! Maybe it’s the argan oil?!?! Ingredients: Butyrospermum Parkii (Shea butter) oil*, Argan oil, Vegetable Squalene, carrot oil, macadamia nut oil, Isopropyl Myristate, avocado oil, castor oil, Sebacic acid, sea kelp extract, essential oil blend, Lonicera Caprifolium (honeysuckle) flower and Lonicera Japonica (Japanese honeysuckle) flower extract and Tocopherol (vitamin E). *Denotes certified organic ingredients. The other two things that I used pretty consistently were Carol’s Daughter Healthy Hair Butter (CD HHB) and Sof n’Free Nothing But Mold and Hold Wax to moisturize, smooth and hold my edges. Although the CD HHB has water as the first ingredient, when I apply it and tie down my edges, it doesn’t make my hair revert. I don’t know if that will be the case for everyone. But, I’ve used this on my straight hair for years and it’s always worked for me. I started using the Mold and Hold Wax on my edges earlier this year and it also works very well for me. It’s very thick and heavy, but not wet, so a little goes a long way. It also doesn’t flake on me or leave my hair hard, caky or sticky if I apply with a light-hand. Since it has dimethicone, it does require a shampoo to remove. But, a sulfate-free shampoo with coco betaine, like DevaCare No Poo, will suffice. So, that’s about it on the hair front! It’s enough, right??? In health and fitness news, I’ve lost about 3.5 pounds in 2 weeks. I slacked and only did C25K two days last week, Wednesday and Saturday. On Saturday, I did do Lauren Brook’s 12 minute Full Body Blast Kettlebell workout before hopping on the treadmill. On both days, I placed my straightened hair in a bun and wore a Dri-Sweat Fit Cap. 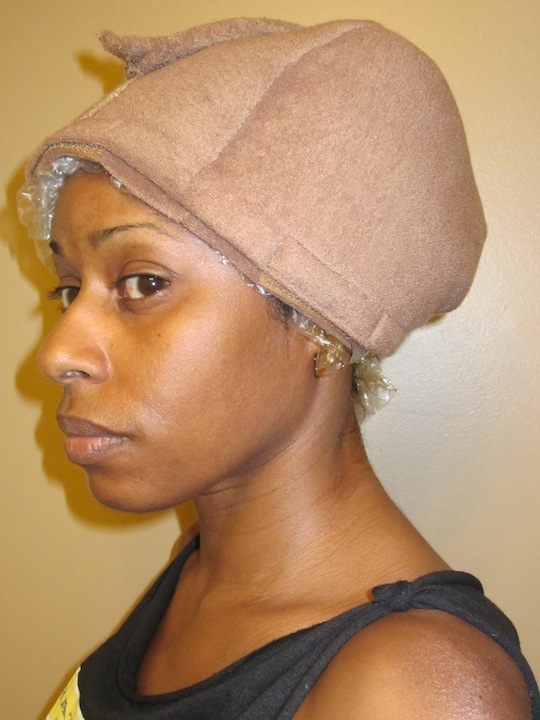 The wide band worked well to absorb the sweat on my face and keep it from reaching my hairline while the mesh cap allowed my head/scalp to breathe, so that it wasn’t sweaty! 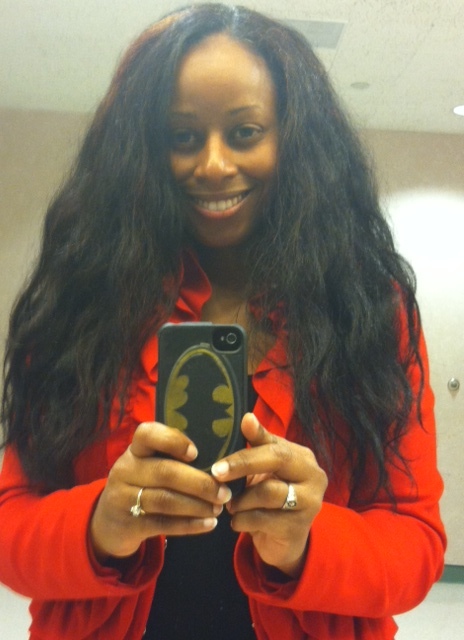 I was very pleased that I was able to preserve my straight hair without the need to apply heat again. With the dri-sweat fit cap and my terry-lined shower cap keeping my hair dry, all I had to do was just apply a little product at night and tie my hair down with a satin scarf for bedtime and repeat in the morning and I was good to go. Although I didn’t exercise as many days as I should have last week, I ate well all work week and made certain that I took my supplements every day. I had more starchy carbs over the weekend than I should have, but they were healthy ones and not really junk, so I didn’t feel too bad about it. I even had Chinese on Saturday night and Sunday for lunch. But, I “healthed” it up by having steamed broccoli and shrimp on brown rice with a drizzle of 1 packet of soy sauce and 2 packets of duck. On Saturday, I picked up some healthy snacks at my local health market. Got these Back to Nature Sweet Potato and Cinnamon crackers that are only 130 calories, 3.5 grams of fat (0 sat. ), and 2 grams of fiber for 20 crackers (mmm mmm good!)!! I also picked up some Blue Diamond Wheat & Gluten free Nut-Thins with Flax Seeds with the same amount of calories, fat and fiber for 13 crackers. I LOVE getting a satisfying amount of food for a small amount of calories!!! In regard to the upcoming week, I need to get back on track with C25K. I have to do day 3 of week 2 and all 3 days of week 3 this week. No biggie except that I have two long days in Trenton. That’s the same thing that happened last week and a 2 hour commute each way always drains me of the energy to workout when I get home. But, I need to push through it as 30 minutes isn’t going to kill me. In fact, what I need to do is get on the treadmill instead of the computer in the morning and #JustDoIt!! I also have a holiday lunch on Friday, so I’m going to try to be strong and order a healthy salad (dressing on the side) and/or a lean cut of meat with veggies! Alright, this post has been SUPER LONG!! Guess that’s what happens when I’m recapping a whole week … and that’s not even all of it ;)! I’m saving something for another post later today!! So, let’s try this again! What’s up ladies?!? 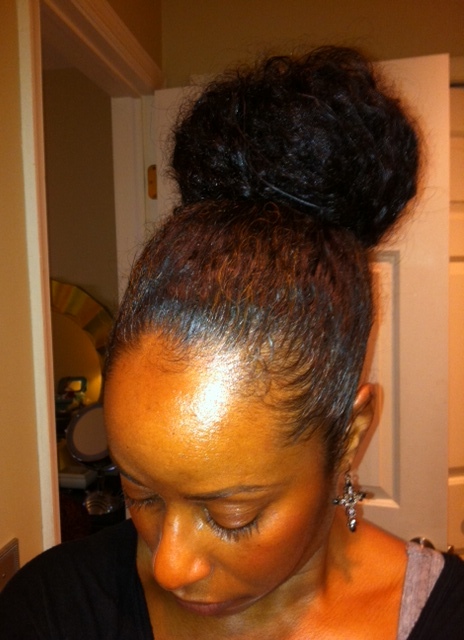 How’s the bunning challenge going for you guys?? 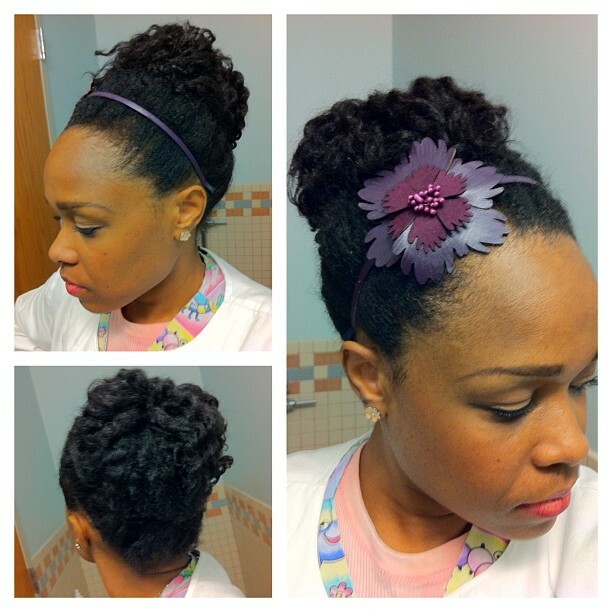 As most of you know, we are hitting the mid-point of the Hairscapades Bunning Challenge!! So, I wanted to take this time to let you know you can check out the progress of some of my fellow bloggers and challengers on their websites. And, not only will you see all of their pretty and creative bun styles, you’ll find product reviews, DIY recipes, fitness, beauty, finances and all kinds of other good stuff! !